A regular and interesting sight in our garden! We love them as they seem to be sprouting freely along the crevices of rocks and bricks, covering empty spaces at the inner border of our garden. A most welcomed volunteer plant that’s happy being a part of our garden treasures. We are most delighted too to share our small plot with these productive additions. 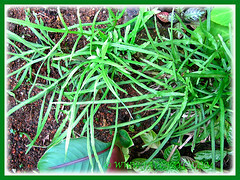 Charming ground covers that supply us free of charge for life! Is not that great… saving a penny or two, even $$? Who can resist such appealing free plants? Delighted that we have relocated some in pots and even shared them with friends and neighbours who were just too happy to receive them. 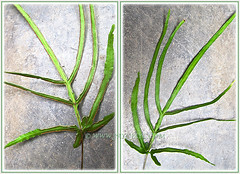 Common Name: Spider brake, Spider fern, Chinese brake, Saw-leaved bracken. Etymology: The genus name, Pteris is the Greek word pteruc which is the Greek name of a fern. The species epithet multifida means divided many times, referring to its variable fronds. Origin: Native to Asia-temperate: China, Japan and Taiwan and Asia-tropical: Cambodia, Laos, Thailand, Vietnam, Malaysia and Indonesia. Nevertheless, it is also naturalized and cultivated elsewhere. 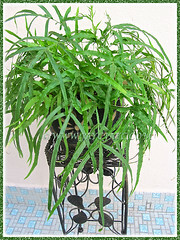 Plant type: An ornamental non-flowering terrestrial and clumping fern. Features: Pteris multifida is charming species of the genus, Pteris that consists of 280 species of ferns that are native to tropical and subtropical regions of the world. In the tropics, it is evergreen but deciduous in colder regions. 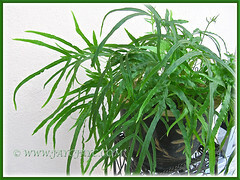 It is a tropical/subtropical evergreen fern with a short-creeping and slender rhizome, bearing fronds closely together. 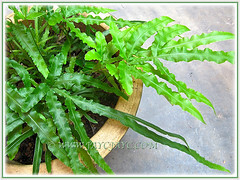 A small to medium-sized fern that is attractive and pretty even though it is purely pale green in colour. Papery and shiny fronds are dimorphic with stipes sparsely scaly and dark brown at the base, glabrous and light green at the higher end. Fertile or spore-bearing frond blade are up to 30 cm long which is about twice the size of the sterile or infertile frond that measure up to 15 cm long. Each frond blade is once pinnate, with 3 to 5 pairs of simple pinnae (each less than one cm wide) extending off the main rachis, with the base pair being the shortest. The terminal pinna is typically singular and very long, a characteristic of many Pteris species. Another lovely feature is its wing-like structure growing along the length of the rachis between the pairs of pinnae. Some of the pinnae margins are wavy. This Pteris species is a non-flowering plant with sporangia (sori) in pale brown and arranged linearly along margin of pinnae. Culture (Care): Pteris multifida (Poiret) grows easily with minimum care. Light: Part sun, semi-shade to light shade. Soil: Grow in well drained and moist soils. Others: Feed once monthly with a balanced foliar fertilizer. Remove stipe and leaf litter that collects in the crown to maintain a pleasing appearance. Generally free from garden pests. For subtropical and temperate regions: Hardiness: USDA Zone 7-10b. Winter hardy to -10°C. It is deciduous in colder areas. 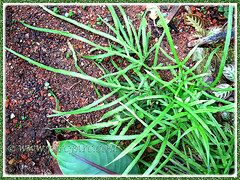 Propagation: By dividing the clumps or allow them to propagate themselves from the spore-bearing fronds. 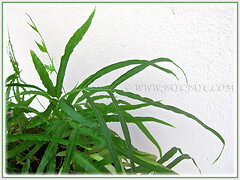 Usage: Pteris multifida will be most attractive in container planting and small garden, outdoors or indoors to decorate your home. It is ideal as a ground cover which will in due course form clumps of closely growing plants, making them a fascinating addition to your shady garden. This Pteris species can be grown amongst rocks, bricks and crevices in shady walls to beautify the area. Botany Boy, sharing his experiences of Pteris species seen in Japan. Another spectacular and favoured fern grown in our garden, probably its cousin, is the variegated Pteris ensiformis cv. Evergemiensis or Silver Lace Fern. 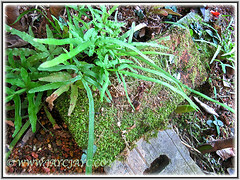 Hi Jacqueline, beautiful plant … is a very rare fern growing in my area where moisture, my mother transplanted into a pot and there he is. They are also welcome to the garden. Nature is extraordinary. Hugs.